Getting kids to help with cleaning isn't easy, especially in the beginning. 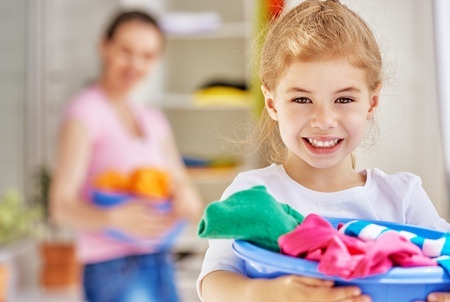 Kids chores should be assigned fairly, based on age. Besides, how much help with monthly chores can you realistically expect from a child? The answer depends on your child's age. Below I've listed appropriate chores for each age group. Remember, the age recommendations are just that, recommendations. Your tidy 11-year-old who has been cleaning his room since age 2 can probably tackle some of the chores listed for teenagers if safety isn't an issue. Conversely, if you've been the maid for your 13-year-old since she was born, you might have to start her off with some of the simpler chores recommended for younger children. Once a child reaches a certain skill or age level, she can generally do the chores for her age group and those for the age groups below. Below are chores for kids monthly by age to get you started. Wipe smudges from walls and doors. Wash out kitchen trash container and surrounding area. Wipe leather furniture with a soft cloth. Wipe of the car's dashboard and upholstery. Dust and clean lighting fixtures. Disinfect the sink and drain. Sew on buttons and mend torn clothes.